Before the application you should start by measuring your false lashes to insure that they fit your eyeshape. If they’re to long, cut them to fit your eyeshape. 1.Apply a thin layer of glue to the flash lash line. 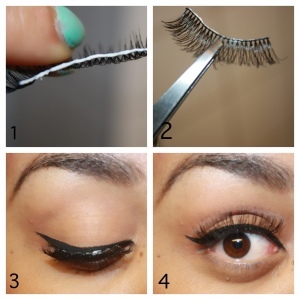 2.When the adhesive is on, take a tweezer and grab the lash in the center. Then wait 30-40sek and to let glue get tacky, this is the most important step. When the glue is tacky it will stick to your lash line. 3.Place the lash as close to your lash line as possible, making sure that the outer and inner corners of the lash are in place up against your lash line. 4.Apply some mascara to your gorgeous lashes, to make your own lashes blend in with the false eyelash. And that’s it! Remember that lashes are reusable, so make sure to keep the case they come in so you have place to store them. The lashglue that I use is Lash Grip by Ardell. It comes out white but it drys clear, which I prefer rather than using black adhesive that can mess up the eyeshadows. 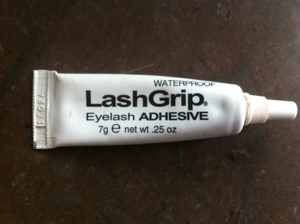 Another thing that I like about this glue is that it it’s waterproof so it keeps my lashes in place all day. Applying falsh eyelashes takes practice so don’t get upset if you don’t get it right the first time. Hope it helps! I’ve always been intimidated by false lashes. I had one failed attempt and then just shied away from them. You really broke the steps down well though…I’m gonna have to give ’em another try!! I was really intimidated by false lashes before as well, but now I just can’t stop wearing them. Taking notes…I’ve only worn lashes once and have never applied them myself. I just received some from a makeup event and I’m gonna have to try them out soon. Its a scary for me to put false eyelashes. i try but I will not succeed it can ruin my day.